Regardless of under what title you call her, Our Lady of Sorrows is an important image of the Blessed Virgin used in the church. In Luke 2:25, Simeon meets Joseph, & Mary as they take Jesus into the temple to present him to the lord after his birth. Luke 2:35 states that Simeon told Mary: “(and you yourself a sword will pierce) – so that the thoughts of many hearts may be revealed.” Mary, through her life on earth with Jesus suffered much. The church attributes seven primary sufferings to her though, which help us to come closer to Christ and share in his passion and our Blessed Mother’s anguish at seeing her son treated this way. 1.) The prophecy of Simeon. 2.) The flight into Egypt. 3.) The loss of the Child Jesus in the temple. 4.) The meeting of Jesus and Mary on the Way of the Cross. 6.) The taking down of the Body of Jesus from the Cross. 7.) The burial of Jesus. Whatever image of the Blessed Mother you find yourself with a particular devotion to, it is important to remember the reason behind our devotion and reverence for Mary. As the Mother of God, she gave her “Fiat” to the angel Gabriel when he appeared to her and told her that she would give birth to Jesus the Christ. Mary said yes to God; she became the first disciple of Jesus, and she dedicated her life to caring for him, protecting him, watching and weeping as he was hung upon a cross and crucified for the sins of the world. Mary constantly through it all pointed to Him, she always directed those around her to her son, and it is with that same spirit that we ask for Mary’s intercession in our lives. We ask her to help us to grow closer to that “bone of her bone and flesh of her flesh.” We ask for Mary to watch over us, shield us with her mantle, and shower us with grace so that we may constantly strive for Christ and may one day rejoice with him in Heaven. 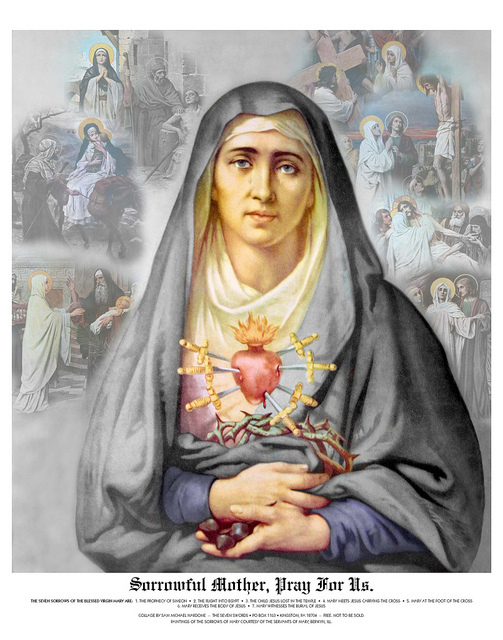 Our Lady of Sorrows, whose immaculate heart was pierced for love of thy son, pray for us! The above video is of the beautiful hymn: Stabat Mater Dolorosa, written by: Giovanni Battista Pergolesi. Stabat Mater Dolorosa is translated as: “The Sorrowful Mother Stood. The hymn sung when processing from each of the Station of the Cross: At the Cross her station keeping comes from a translation of this hymn. ← Welcome to the world of Catholic Blogging C.J. Glaser!